The Harry S. Truman Carrier Strike Group (HSTCSG) is being deployed to the Mediterranean Wednesday, where it will join the USS Donald Cook off Syrian territorial waters. 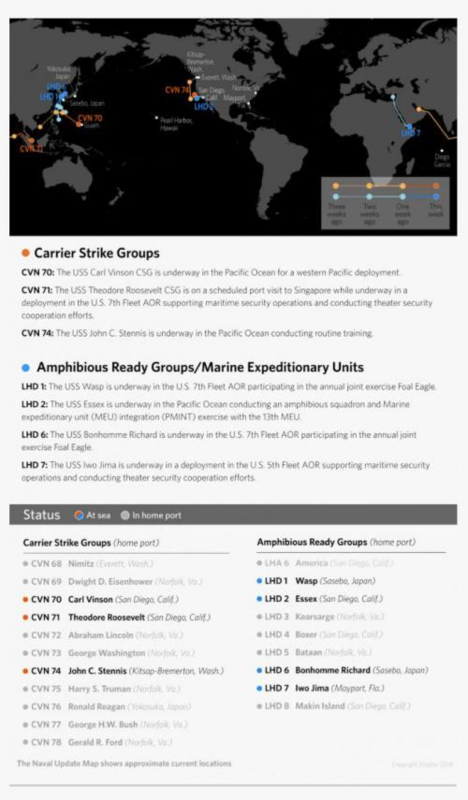 The aircraft carrier will be accompanied by guided-missile destroyers USS Arleigh Burke (DDG 51), USS Bulkeley (DDG 84), USS Forrest Sherman (DDG 98) and USS Farragut (DDG 99), as well as the guided-missile cruiser USS Normandy (CG 60). The Destroyers USS The Sullivans (DDG 68) and USS Jason Dunham (DDG 109) will join the HSTCSG later, according to a statement by the US Navy. The Sachssen-class German frigate FGS Hessen (F 221) will also operate as part of the strike group during the first half of the deployment. It is worth noting that it will take approximately 6-7 days for the group to cross the Atlantic at 30 knots, plus another 3-4 three days once it arrives in the Mediterranean, to reach Syria, suggesting a full-blown on attack may not take place until after April 22 or so. This will be the first extended deployment for the Harry S. Truman since wrapping a 10-month maintenance period last July. The mission will include "maritime security operations and theater security cooperation efforts alongside allies and partners," and they will "provide crisis response capability and increase theater security cooperation and forward naval presence" in the Middle East and Europe, according to the statement. Yesterday, guided missile destroyer USS Donald Cook armed with 60 Tomahawk cruise missiles anchored off of Syrian territorial waters, and has reportedly been "harassed" by low-flying Russian warplanes, which have buzzed the "Arleigh Burke" class warship at least four times according to CNN Turk. A Navy source confirmed the deployment, saying that the guided-missile-destroyer had just completed a port call in Cyprus, while the Pentagon reportedly draws up plans for how to deal with the situation.